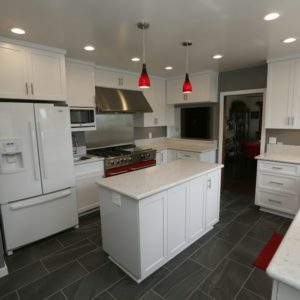 Depending on the scope of your project,Kitchen remodeling in Fountain Valley CA has the potential to involve many challenging tasks, from installing perfectly level countertops and cabinets to rerouting plumbing and gas lines. Naturally, you need an experienced contractor like Cabinet Magic to make your project a success. Cabinet Magic offers the quality construction and installation services you expect from a licensed contractor, along with excellent prices on designer products and as much or as little design assistance as you may require. Kitchen remodeling in Fountain Valley CA can range from simply updating the room with new cabinets, fixtures, and accessories to totally redesigning the floor plan. In either case, you may be concerned about how the finished project will turn out. After all, samples can look quite different in your hand than installed in your kitchen. At Cabinet Magic, we never want our clients to feel worried that they’ll be anything less than thrilled with their kitchen remodeling in Fountain Valley CA. That’s why we use computer rendering software to create detailed 3D images showing what the finished remodel will look like. This way you can see every detail and approve it before we begin work. The centerpiece of any kitchen design is the cabinetry. Cabinet Magic has been creating stunning custom cabinets right here in California for nearly 30 years, and we can make your design vision a reality. We employ talented craftsmen capable of working in any style to suit your interior design scheme. We offer a variety of different woods as well as a complete palette of designer colors. We maintain strict quality standards so you can rest assured your new cabinets will fit your space perfectly and stand the test of time. Are you ready to stop dreaming of kitchen remodeling in Fountain Valley CA and start actually making it happen? Call Cabinet Magic at 800-828-4380 now and request your free in home consultation. We’ll be happy to share ideas and provide a free estimate for the project.